Reprint of LEC #191, 18th Series, V. 6, in 1948 in 2 volumes. Front Binding – Finally, after four years of operation, Miguel Covarrubias makes his debut on my blog. Yikes. 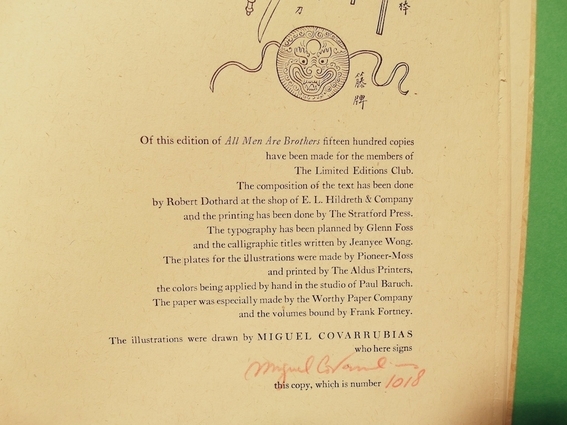 The Heritage Press exclusive of “Green Mansions” with the Covarrubias illustrations was first issued by the Club in Series A (in fact it was the first Heritage Press book issued after the initial 6 books). Series A began in June, 1937 with “Green Mansions.” I believe the 1936 copyright date is for the illustrations as the LEC had copyrighted the text when they issued the LEC version with E.A. 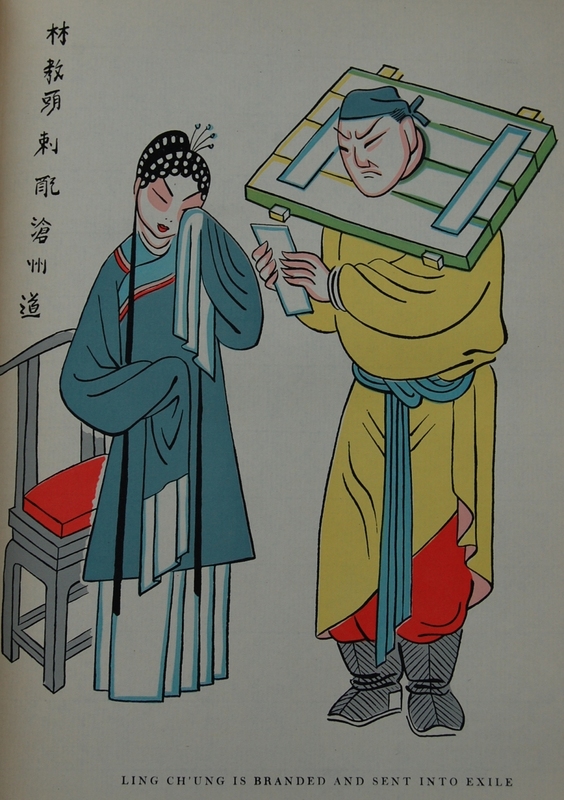 Wilson’s illustrations in 1935. 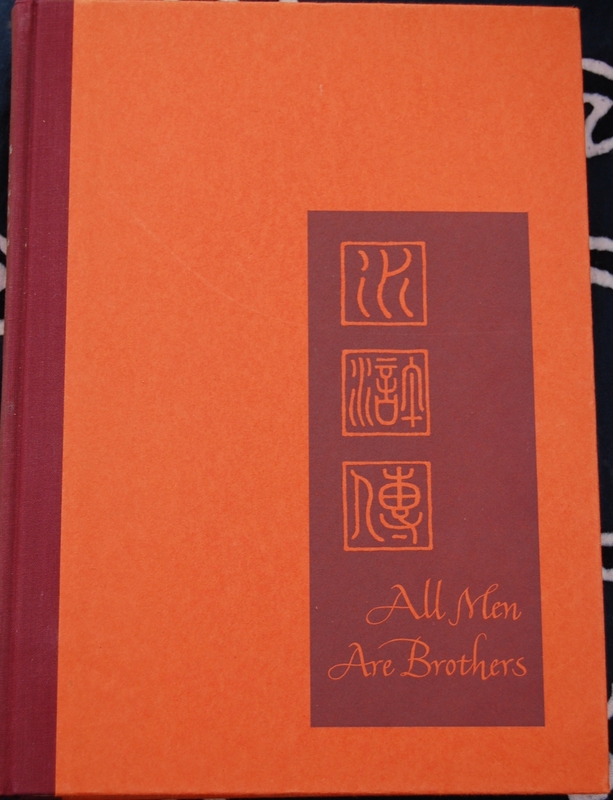 As for the book itself, All Men are Brothers is one of the few Chinese titles issued by the LEC in its run. 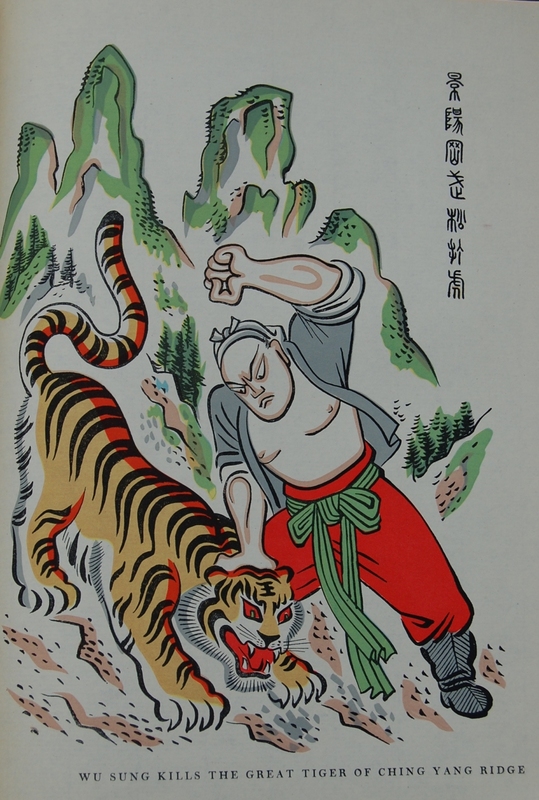 Confucius was popular enough to warrant two editions of his Analects in 1933 and 1970, but that, alongside this book, is it. The Sandglass provides some details on the history of this particular book, for those curious about its past. The “Robin Hood” comparisons are interesting to me, as I happen to like the mythos of Sherwood Forest’s outlaw. 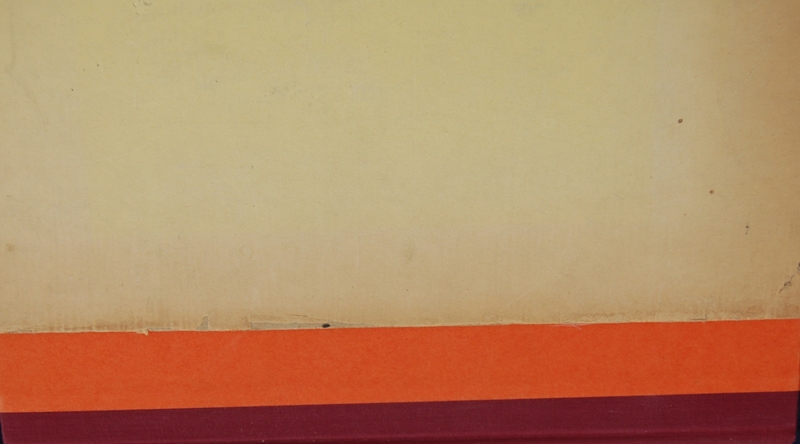 Slipcase – It’s hard to tell here, but the case is yellow as the Sandglass notes. 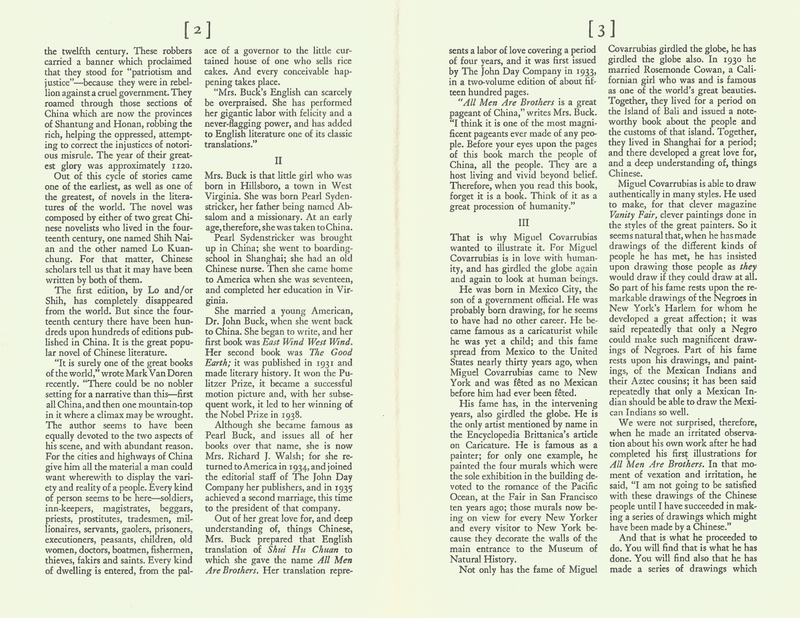 Title Page – Pearl S. Buck, probably the best-known Euro-American author to write about China, and the author of The Good Earth, had her sole LEC contribution be the translation of Shui Hu Chuan’s text here. 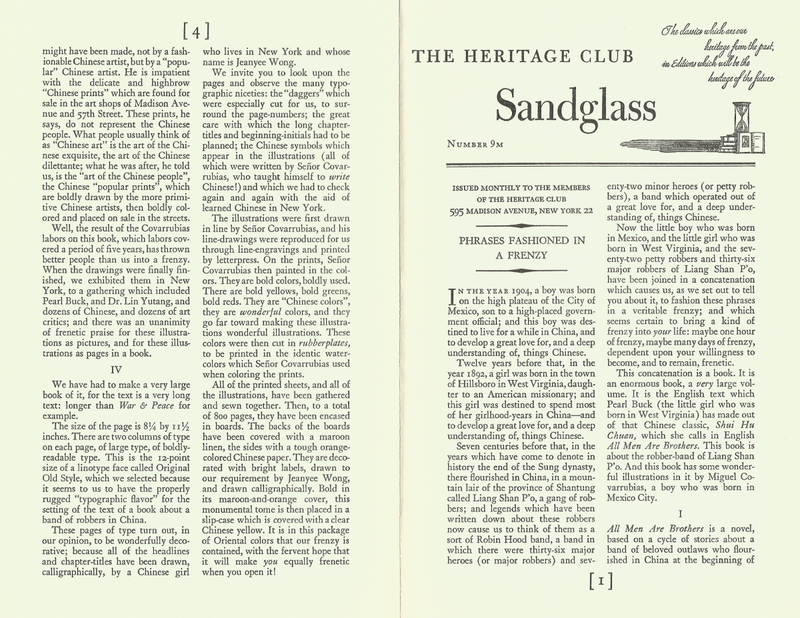 It was not done for the LEC, as John Day originally published it in 1933, but the Sandglass exudes respect for the four years of hard work and care Buck applied to the English rendering of this novel. Lin Yutang, a noted Chinese translator/writer in his own right, provides the introduction. This book really is a cavalcade of talent! Page 11 – Covarrubias did such a wonderful job on these drawings I felt compelled to share an extra image. 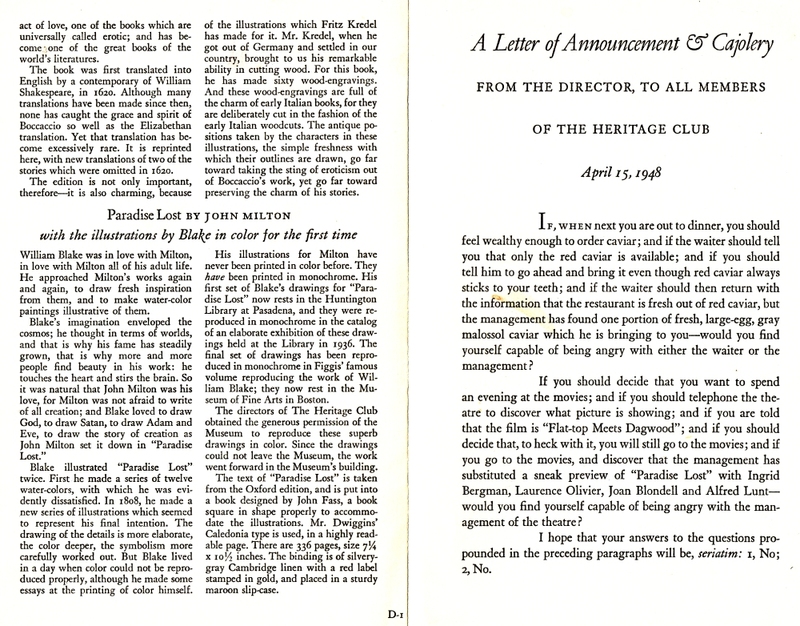 Also, an example of the text. 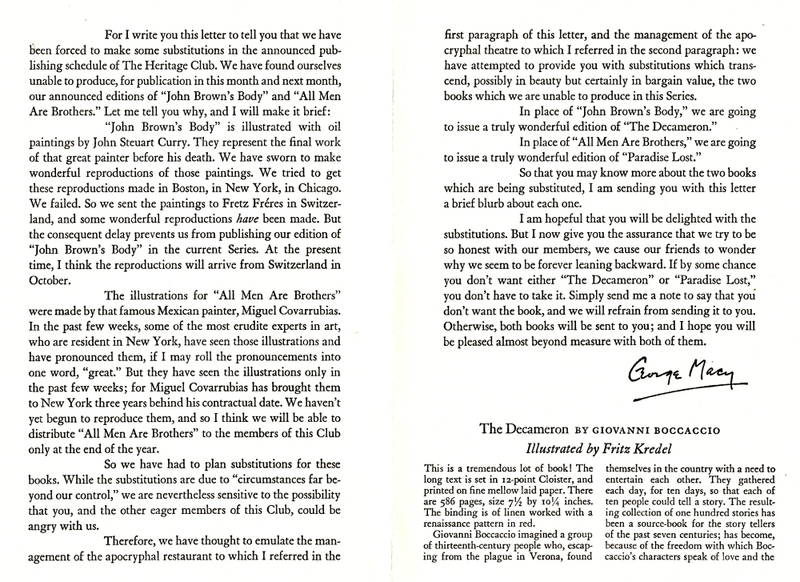 Personal Notes – This is a book I’ve coveted for a long, long time. I picked it up at last from the Oakhurst Library collectible sale last September, and I have no regrets. A masterful book all the way around. Wow, Robert, you answered all of my questions! :D I’ll fix all of that (and apparently I have yet another Heritage Press exclusive to add!) here shortly. Thanks! I came across an old book at a local bookstore that has new and used books. 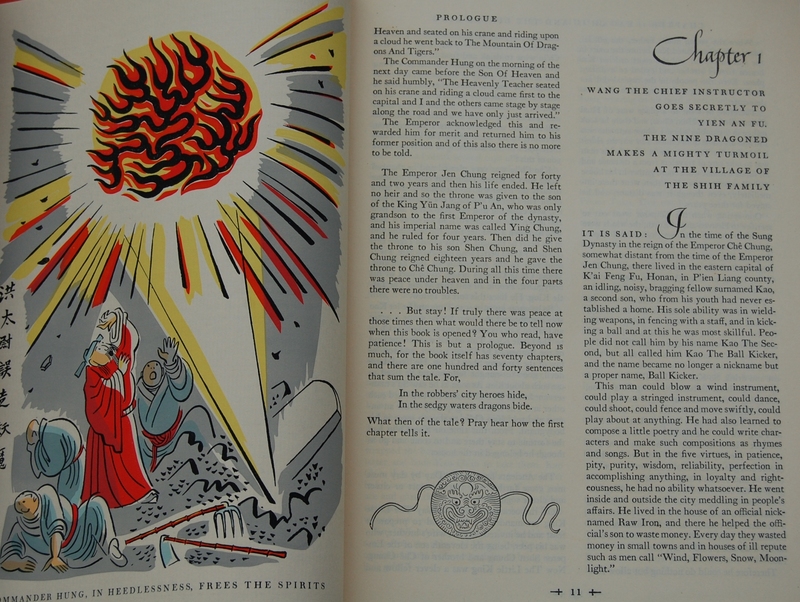 It’s called “The Conquest of Mexico” and one of the first inside pages reads “A History of The Conquest of Mexico by William Hickling Prescott with the preface by the author; the text edited, with an introduction, by Harry Block; and the illustrations drawn by Miguel Covarrubias: for the Heritage Press, New York.” The book also mentions that it was printed in Mexico and I had also found a Heritage Club Sandglass issue Number 3N in between some pages within the book. I haven’t had very much luck researching the date of when this book was actually printed since there is no print date within the book. This is all very new and interesting to me and I was hoping you might have more information. 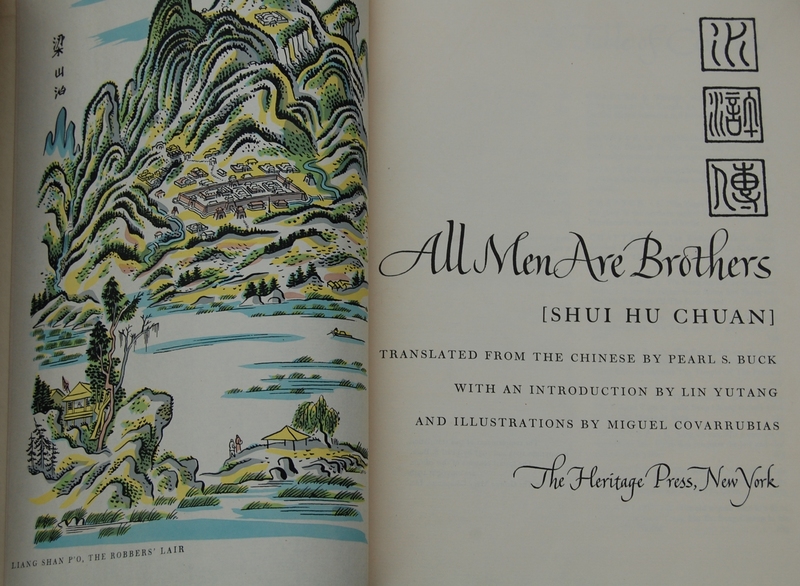 You are currently reading Heritage Press: All Men are Brothers by Shui Hu Chuan (1948) at The George Macy Imagery.